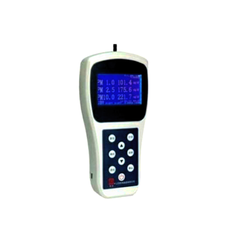 Pioneers in the industry, we offer handheld dust monitor from India. We have gained a remarkable position in the industry by offering a qualitative assortment of Handheld Dust Monitor that is used to monitor the suspended Particulate concentration in the air. The offered monitor is manufactured employing high-end technology and well-tested components in observance to industry defined guidelines. Apart from this, the entire range is scrupulously tested under the strict inspection of our quality controllers. This range can be availed from us in various specifications at market leading prices. •Sampling dust and particulate matter is important as dust and particulate matter can affect the health of humans, as well as the natural environment. •Dust and particulate matter can cause respiratory problems when breathed in by humans. Dust and particulates above 10 micrometer (PM10) are filtered and generally do not enter the lungs. •Dust and particulate matter that is smaller than 10 micrometers (PM10, PM2.5, PM1.0) can enter into the Alveoli where gas exchange occurs. •This PM2.5 is more dangerous as it can affect the exchange of gases within the lungs and even penetrate the lung into the blood stream and cause other health issues. •PM10 , PM2.5 and PM1.0 are the normal sampling standards found throughout the world, they represent the particulate pollution that effects human health and thus sampling them provides an accurate insight into how dust and particulate matter effect human health. •Handheld/Portable PM Monitor is used to monitor the suspended Particulate concentration in the air with measuring range 0.001mg/M3 to 10 mg/M3. •It adopts optical scattering technique. This type of Product has many advantages, such as fast detection speed, high accuracy, light and small, easy operation, measuring and displaying of 3 channels at the same time. •It adopts the method of automatic measurement, improving the work efficiency effectively.